I purchased a Digikey ZigBee module and it has a very strange SMA connector(pic-a). Although they have provided an antenna with the module, which is designed only for that connector(pic-b). 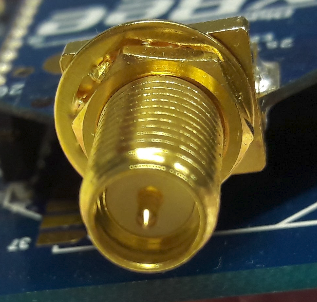 No other antenna or RF cable fits in that DigiKey module SMA port. I came to know that its called reverse polarity connector and its very common in commercial devices but not in lab devices. I don't know why they have used it. I only have antennas which are "normal", I mean normally used in labs(pic-c). I just google for SMA gender changer and fllowed links from pictures. You'll find RP in USA because of bizarre FCC rules contrary to the rest of the planet. This may be contrarian, but I like the design of the part that you received in comparison to the standard design. The connector on the module has no moving parts and therefore will have reduced wear. 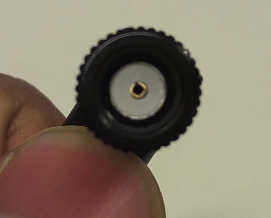 The connector on the antennae has a moving part, an expanding ring, that probably floats inside the nylon housing. With repeated on/off cycles, this can fail, either physically or in its electrical characteristics (dielectric, capacitance, resistance, impedance). Fortunately, as a screw on antennae, getting the device back into functional specification is as simple as replacing the antennae. Were it the standard style of connector, there would be some disassembly/reassembly soldering involved with the module, and that could adversely affect the functional specifications, violating any kind of certification the module is currently conformant to. Given that the device you purchased appears to be for learning/development purposes, I'd hazard a guess that the manufacturer was aiming for reliability. When you call them to tell them you have a problem, technical support will suggest something like, "Have you tried a new antennae?". 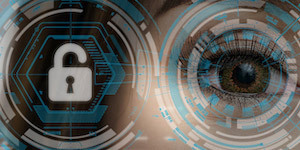 Zigbee is a ubiquitous network technology, they probably want to minimize the risk of an experimental device from messing up a commercial operation. All the Smart Power Meters in Ottawa use Zigbee. Thanks, it was very much informative! Reverse polarity SMA (RP-SMA) is a variation of the SMA connector specification which reverses the gender of the interface. The term "reverse polarity" refers only to the gender of the connector's contact pin, not in any way to the signal polarity. 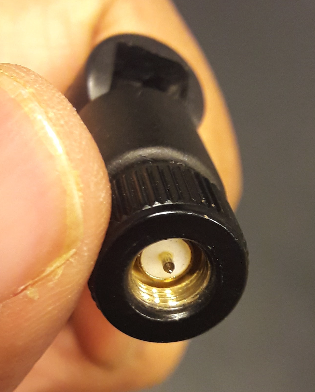 A RP-SMA(F) connector is a JACK type - has outside threads - but has an inner pin (hence reversed), and male RP-SMA connector has inside threads and a center receptacle. RP-SMA connectors were introduced to separate professional and commercially available equipment, preventing unintentional or intentional connection of high-gain professional antennas with SMA connectors and commercial wireless equipment with RP-SMA connectors, violating federal or international laws. Today, however, both types of connectors are readily available. Receive a notification when a new discussion is started in this forum (Electronics-Related.com).